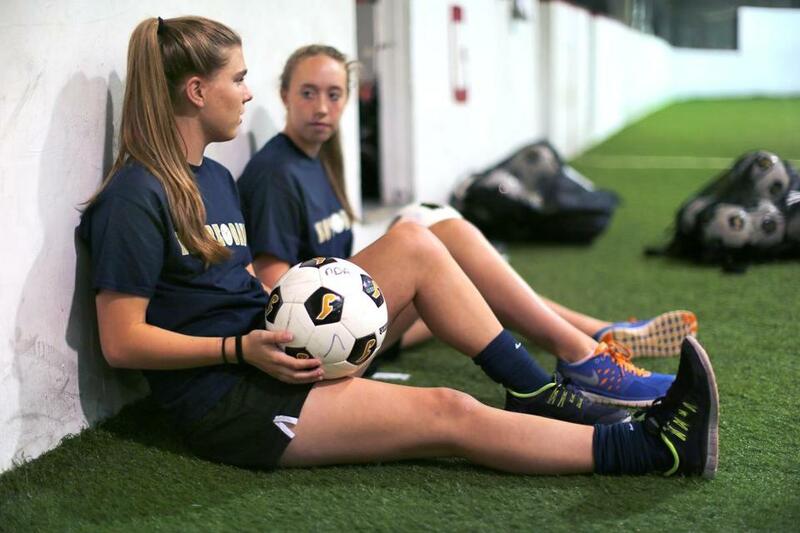 Notre Dame of Hingham soccer players Kristen McCrea and Lexi Noyes both suffered torn ACLs and had surgery, causing them to miss this season. Brandi McDonald knew something was wrong right away. The East Bridgewater High midfielder went to pivot in pursuit of the ball last October against Norwell. McDonald tore the ACL in her left knee, joining a growing number of young athletes, particularly young girls, who have suffered the same fate. Seventy percent of ACL tears, according to Dr. Martha Murray, orthopedic surgeon at Boston Children’s Hospital, are the result of noncontact injuries. Murray said the injury is more common among females than males, with the ratio ranging from 2 to 1 to 8 to 1. She said there are multiple theories as to why young women are at greater risk, such as hormone levels during the menstrual cycle that may affect the strength of knee ligaments, or that females have wider hips than males, changing the angle of pressure on the joint. According to Murray, the peak age for women to tear an ACL is between 15 and 19 years old. She said the best way to avoid ACL injuries is perform specific exercises targeting the knee, and she encourages coaches to download a training program for young women posted online by FIFA, the sport’s international governing body. McDonald, who underwent reconstructive surgery last December, has been stellar in her return this fall as a senior captain, recording a team-high 12 points (six goals, six assists) in East Bridgewater’s 5-2-1 start. At Notre Dame of Hingham, junior Kristen McCrea and sophomore Lexi Noyes have been relegated to spectator status after tearing ACLs this past summer with their club teams. They will not play this fall for Notre Dame, the defending Division 2 state champion. Her teammate shared the same emotion at the thought of missing an entire high school season. The two have created a support system as they both go through physical therapy separately two to three times a week. 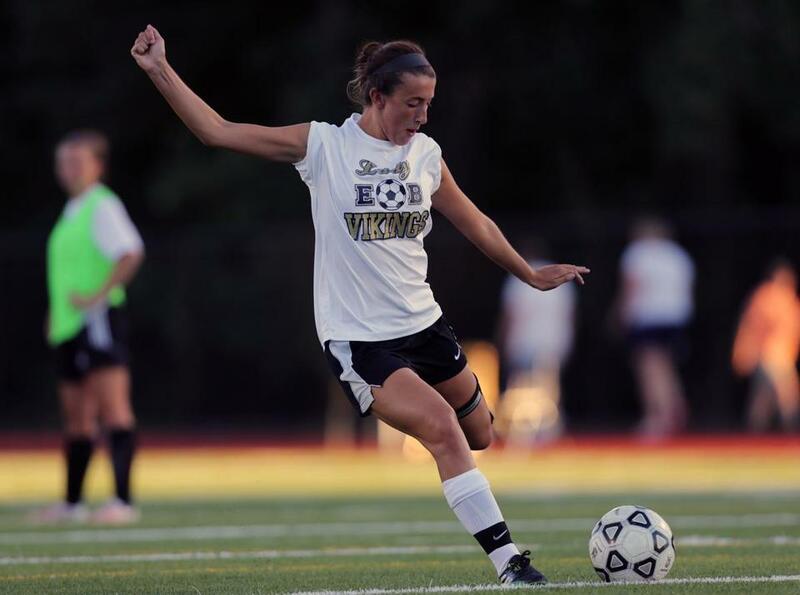 East Bridgewater senior captain Brandi McDonald (below) is back playing this year after rehabilitating her torn ACL, which she injured during a game last October. Their next goal: being able to run again. Danielle Gordon, the varsity assistant coach at Notre Dame, said she feels their pain. She had earned a scholarship to play at Boston College, but suffered a torn ACL the spring of her senior year at Rockland High. No matter how long an athlete takes to rehabilitate a torn ACL, the likelihood of retearing the cartilage or tearing the opposite ligament is higher. Michael McMahon can be reached at mike.mcmahon@globe.com. Taylor C. Snow also contributed to this story. He can be reached at taylorcsnow@yahoo.com.